In recognition of your achievement, a 2008 Best of Wellesley Award plaque has been designed for display at your place of business. 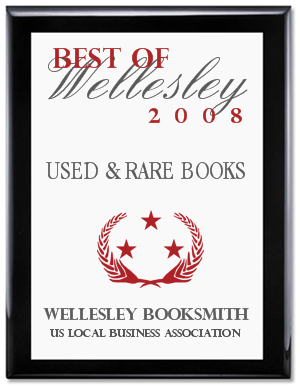 You may arrange to have your award sent directly to Wellesley Booksmith by following the simple steps on the 2008 Best of Wellesley Award order form. Simply copy and paste this link into your browser to access the order form: (link removed). Wow. Isn’t it so nice to be recognized for our hard work BY AN ORGANIZATION THAT DOESN’T EXIST?!? Yes, if my title didn’t already give it away or you hadn’t already smelled a rat here, the fact is that the U.S. Local Business Association does not actually exist, and this faux award is a ploy to get us to buy a very expensive plaque announcing our achievement. We are just one of who-knows-how-many small businesses to receive this very same e-mail, as it evidenced by Googling the USLBA or reading the comments on a related post about such "vanity scams" on the blog at ResponsibleMarketing.com. Fortunately our store is not so desperate for "faux plaques," seeing as how we’ve earned a few real ones and (more importantly) we get a lot of kudos from our customers and our larger community. But, man. Isn’t it just a slap in the face to think that businesses out there might be falling for scams like this? Or that individuals might actually be paying to be members of Who’s Who? And, just as interestingly, to wonder if a store’s customers are impressed by the awards they see decorating a store’s walls, even if they aren’t familiar with the organizations that (supposedly) awarded them. This last bit is the part that really interests me, because, of COURSE I’ve unwittingly put stock in the awards I’ve seen displayed in a business, even when they were given by trade groups of which I have no knowledge. This does not mean that seeing those awards has been enough to sway my choice of whether or not to give someone my business, but it’s true that seeing someone recognized for doing good work can make you think better of them or do a tiny bit to tip those business scales. Why else do publishers put blurbs by other authors on the covers of books, or list the awards a book has won? Do you think your average customer in Massachusetts has any familiarity with the Texas Bluebonnet Award? No. They probably don’t. Nevertheless, if they see that a book won that award, they might be just a teensy bit more inclined to buy it. This entry was posted in Uncategorized on October 29, 2008 by Alison Morris. Alison, thank you for this excellent story! It should be submitted to the National Organization for Awareness of Scams and Fake Awards Magazine for their fake annual award recognizing stories that uncover scams and… fake awards. Ok, trying to be funny, but thanks for your story! What about them there “Parents’ Choice” awards? I’ve poked around their website and see a plethora of application forms and fees but a paucity of attendant criteria and information about the judges. Texas librarian, THANK YOU for making that clarification! I did NOT mean to imply that the Texas Bluebonnet Award is either a “scam” or anything less than a truly great award! I just picked it (at random) from among the many impressive, legitimate, regional awards that your average Massachusetts reader is less likely to know. I sure hope your readers don’t think you are putting the Texas Bluebonnet Award in the same category with these scams. A customer in MA may not be familiar with this award given by the Texas Library Association any more than they might be familiar with the Boston Globe Horn Book Award but hundreds of thousands of Texas school children read the books on the TBA list and then vote for their favorite. Many publishers would like their books (from a sales perspective) to be nominated for the Texas Bluebonnet Award because it generates almost as much in sales as winning the Newbery. That says something! Well said! We were ourselves notified last week by the USBA that we were “Best of Farmington” Bookstore, which was too ludicrous an award concept to strain credulity for even a nano second. I suppose they may have had more luck with Farmington auto supply and hardware stores, which are more plentiful here.